To quote a friend and new mom, "everybody loves babies! everybody is CRAZY FOR BABIES!" so maybe I'm feeling a little biased right now. Yup, you heard right! Another baby is joining the mix here at Seven Sisters. 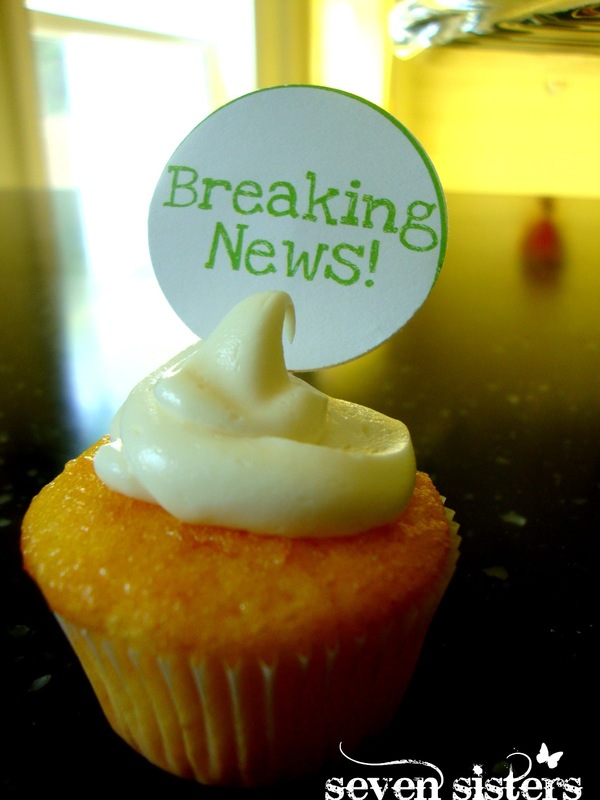 I debated long and hard on how/when to announce it on the blog. I considered not announcing it at all, but ya'll might think I'm a little weird when the baby projects start popping up and there was no announcement! The reason I've felt so cautious is because this baby has been thought of and prayed for and hoped for for the past two years. I'm not quite ready to share the whole story, but I can say this baby is nothing short of a miracle, and God is so good. The short story would equal an infertility diagnoses, fertility treatments, and now 15 weeks of perfect pregnancy-dom. One sentance in no way does justice to any of that, and I hope you'll excuse me and that someday I can tell the whole story with clarity and completeness. Right now I just feel so humbled and honored for this answer to prayer and huge (little) miracle. We are basking in God's goodness and still pinching ourselves that this is really happening and staying busy working on the nursery and all those other baby preparation things! Speaking of the nursery, that brings me to the first project I can't wait to share, the mobile. Our nursery bedding is the Migi Splash . We bought it off eBay for a great deal! We don't want the nursery to be too "theme-y" or matchy-matchy though. A lot of the inspiration for the room came from the bedding's stock photo, but of course I put my own spin on it. More on the nursery as a whole to come! But you'll get a few sneak peeks below, like paint color :). 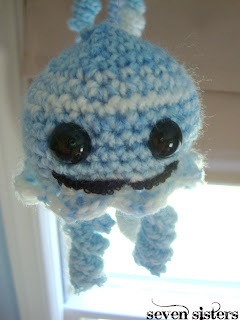 So, we didn't get the Migi Splash mobile, lamp or curtains. 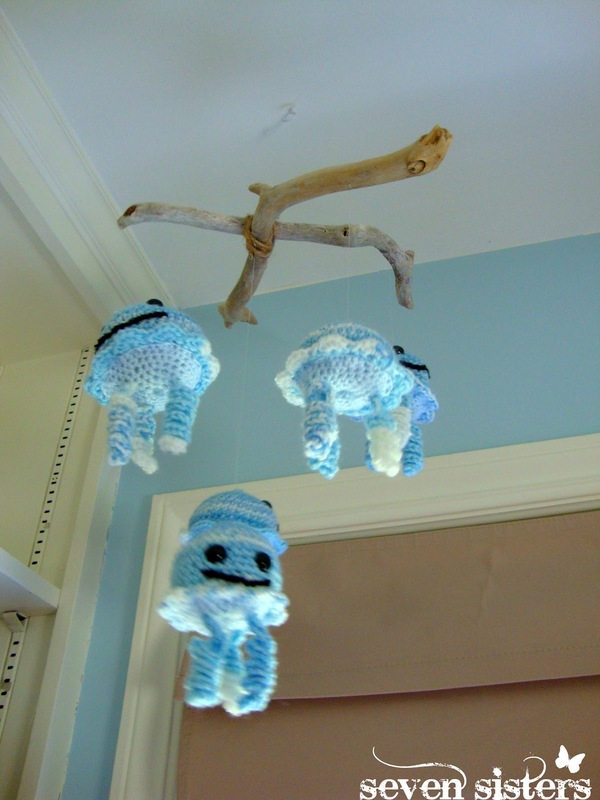 But I didn't want a babies room without a mobile at all! Enter the Jellyfish Jam pattern by Bittersweet. LOVE this pattern, SO EASY and it's FREE! I crocheted 5 of them. On some of them I added/removed a few rows to the body to make some bigger/smaller than others. 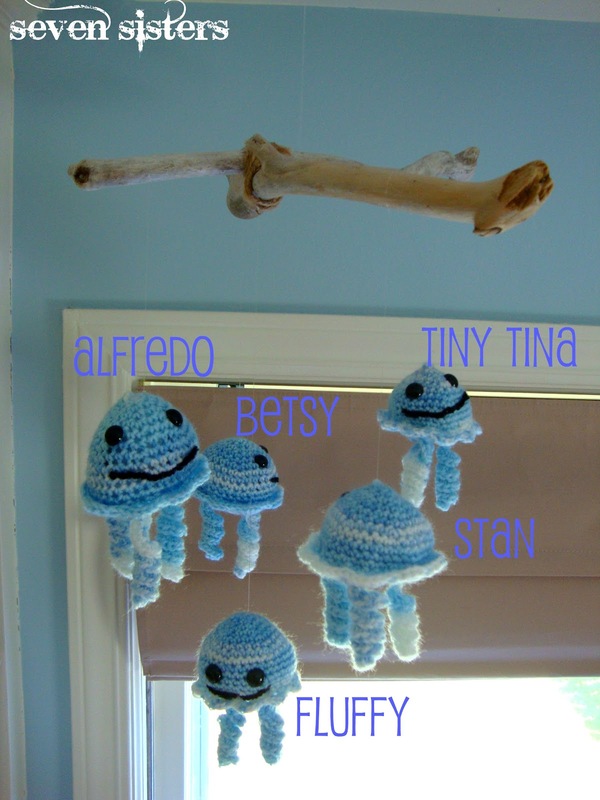 Meet the fam: Alfredo, Stan, Betsy, Fluffy and Tiny Tina. 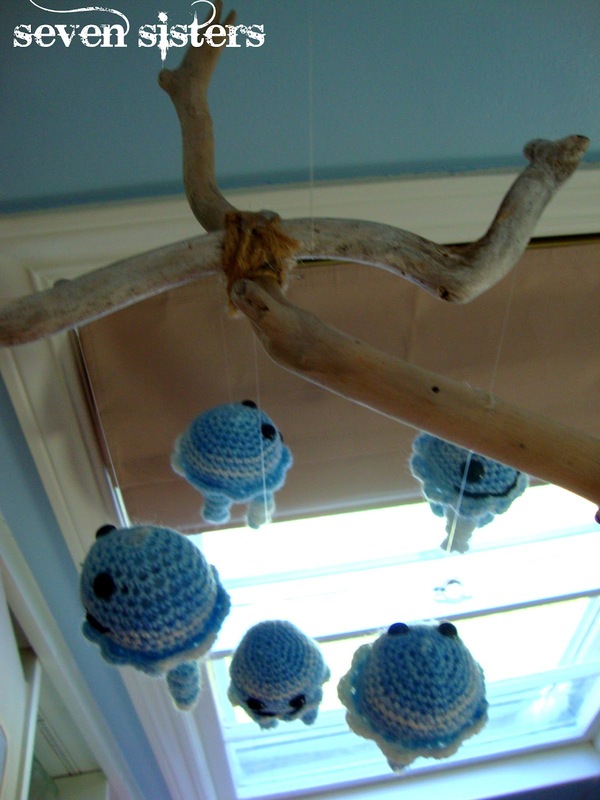 After I crocheted them, I bought some fishing wire, and found some driftwood (so easy to find at the lake/beach!). I also had some jute string on hand. 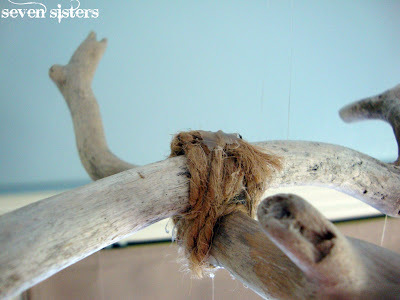 I simply put the driftwood in a cross pattern, and tied the jute string around it till they were rock solid in place. I also secured it with hot glue on the top. Looks kinda ugly, but you can't see the glue from where it's hanging (over the changing station). After that I just added some fishing wire to the top of the head on each jellyfish and wrapped it around the driftwood. I added a little dot of hot glue at the top to keep the fishing wire secured in place on the driftwood so it couldn't slip off. So, what do you think? Are you baby crazy? 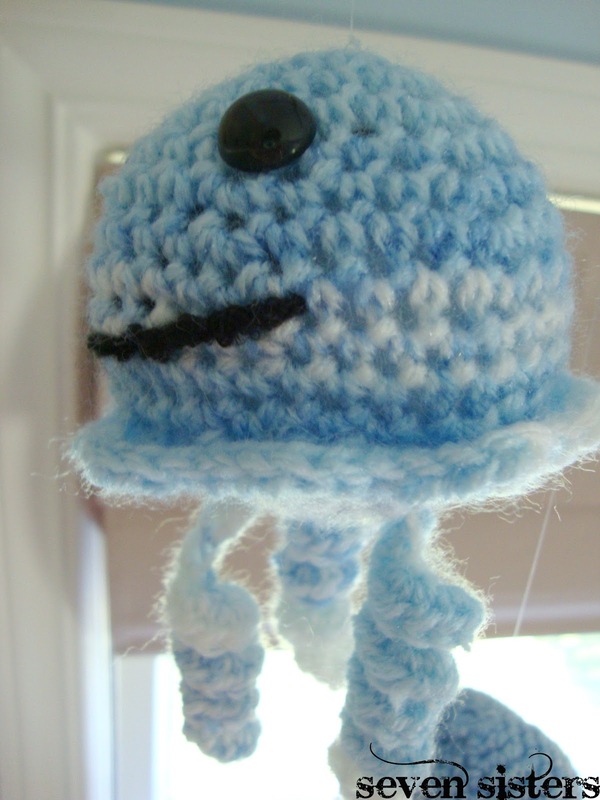 Can you do the jellyfish jam? Could you, would you, eat green eggs and ham? Did someone say "green eggs and ham?!" Congrats *S* I am super excited to become an Aunt all over again! Congratulations and prayers for continued success through the next months of fun!